Teaching Authors--6 Children's Authors Who Also Teach Writing: Teen Read Week! Poetry Friday! Beautiful poem, April. Is there anything better than going to the library with no particular book in mind and exploring the stacks for something to read? What treasures there are to find. 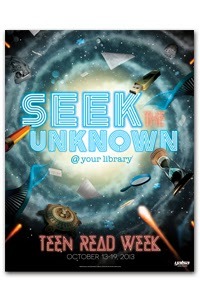 Thank you for sharing information about Teen Read Week. I am always a little envious of all of the amazing literature available to teens today. I enjoyed your poem. I guess possibly imprinting can have many meanings. Definitions are in the eye of the "definer." Your poem instantly made me feel as if I were sitting in a classroom as late middle or early high school student. The ending of your poem is such a kick in the gut, and what a reminder of teenage years! Thanks for sharing the poem and making me smile with the duckling video. I was fascinated by the concept of "imprinting" when I learned about it in college (I think). And I think there are a few times in human lives - as your poem indicates - that we also have imprinting going on. Thanks for sharing the video. Too cute! Hope he finds his mom though! That was one of the dangers of imprinting - finding the wrong thing! A poem that good doesn't have to "fit" any theme. Beautifully done and reminds me to get your book into the hands of my daughter. Oh, that duckling! What a perfect accompaniment to the poem! April, I like the turn in this poem. Thank you. I loved your book when I first read it, & now you remind me that I need to lend it to some students again! It is Teen Read Week & I've given a few book talks just for that purpose, new and old-lots of wonderful books are available. Thanks April! 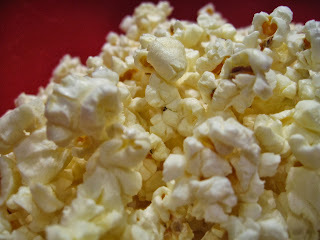 April-- the air-popped popcorn for brains image is perfect, and one I can relate to! And I love your poem. It says so much in so few words! Those poor ducklings, though, imprinting on a vacuum cleaner. Maybe you could turn the story into a humorous picture book? Imprinting has always fascinated me. Carmela--maybe you're right about the PB idea. Hmmmm...I've put it in my "hot idea" file.